Our Luxe Suede Carrier from Susan Lanci Designs. Valentine’s Day is a perfect excuse for a Posh Puppy Pet Party. Start by having your friends carry their precious small cargos is comfort, style and safety in our Luxe Suede Cuddle Carrier ($130) from designer Susan Lanci. Available in fawn, pink, denim or black, these carriers feature a soft suede exterior. The interior is linked with blanket-grade Minky Curley Sue fabric. The bags also have an extra wide adjustable shoulder strap, a 12-inch wide front storage pocket, a dog tether and a snap hook to close of the top of the bag. These bags are made in the USA. Once your pet guests arrive, treat them in style. Give them some of our All Natural Valentine Mini Bone Treats (a set of eight is $18). These peanut butter treats include honey, oats, wheat flour canola oil, cinnamon and dried eggs frosted with vanilla yogurt chips and sprinkles. Let them burn off their doggie calories by playing with our I’m Diggin’ You Plush Toys ($15), our Plush Dots Minky Heart Toys ($12) or our Plush Minky Heart Toys ($12) with squeakers. The Mink Heart toys come in small and medium sizes with two or three colors to pick from, depending on the toy. These bandannas come in three sizes. Bigger dogs will have a blast playing with our 32-inch Love Pup Caterpillar Dog Toy ($30). These red and pink toys have five squeakers, one in each section with the words “Love Pup” embroidered on the body. Dress up dogs of any size year-round with our Sweat Heart Chiffon Dog Bandanas ($14) in pink or purple. These 22-inch squares are made with 100 percent polyester and are machine washable. Our “I Woof You” bandanas ($20) come in small, medium and large sizes. Made with 100 percent certified organic Turkish cotton, they are prewashed to avoid shrinking. Little girl dogs will look even cuter than they naturally are with a new hair bow. We have many to choose from, including our Be Still My Heart ($10), which comes with either latex bands or a French Clip. Other Valentine’s Day options include our Love Games in Turquoise($10), Love Games in Red ($10) and our Be Mine Barrette ($14). Be sure to grab the perfect photo of your precious pooch and enter our Monthly Photo Contest. The winner gets a $50 Posh Puppy Gift Certificate. Our Love Bug Antenna has an adjustable elastic strap. Is your pooch a real sweetheart? Then top him or her off with our Love Bug Antenna ($10) or the Sweet Heart Hat ($15) before filling them up with delicious dog-friendly treats from the Posh Puppy Boutique. Your friends’ eyes will bug out when they see your pooch bouncing along wearing their antenna, which has an adjustable elastic strap. Our Sweet Heart Hat has an adjustable Velcro strap and makes a purrfect gift for any dog lover. If your pooch complains about wearing their new hat, butter them up with some special Valentine’s treats. We have many assortments to pick from. Our little Valentine Heart Treats ($6) are made to order with messages of love. The I Love You Boxed Treats ($15) has an assortment of 16 cookies in flavors including carob chip, belly rubs, snickerdoodles and muddy paws. Three similar assortments are our Tails of Love ($16), the Pugs & Kisses ($16) and Sweet Dreams ($16) sets. All four include a letterpressed gift card. Valentine’s Day traditionalists might opt instead for our 6.5-inch velvet Heart Box Treats ($27). This box, complete with a satin bow, contains seven assorted cookies, six assorted truffles and a bon bon. We also have a box of four snickerdoodle Heart Bon Bons ($18) that are surrounded by yogurt coating. These treats are made with organic flours, cage-free eggs and wildflower honey. For young and old pups who can’t get enough snickerdoodles, buy them our Valentines Snickerdoodles Box Treats ($20) with 25 cookies made with ingredients identical to the bon bons above. Some dogs seem to communicate with their eyes, ears and barks. Let them express themselves with our Conversation Medium Heart Dog Treat Gift Box ($30). Order them now because these hand-made treats take 1-2 weeks to make using all natural peanut butter dough. Dog versions of human “chocoholics” (chocolate is deadly to dogs and cats) will scarf down our Carob Dibbed Heart Cookies. Each assortment of six peanut butter cookies is baked fresh when you order, so allow extra time. These and hundreds of other fashionable Valentine’s Day gifts are available now at the Posh Puppy Boutique. Show your little lap lover—weight is not an object—some Valentine’s Day spice with a classy collar or leash from the Posh Puppy Boutique. Our Heart Charm Dog Collar and Leash (collar, $20, leash $30) feature red hearts on a black background with red faux leather lining. Collars come in sizes from 6-8 inch to 14-18 inches. Leashes are available in 4-foot and 6-foot lengths. Our Charmed Croco Leads ($26) and matching collars ($26) are a perfect pair. Both are made with soft, padded faux leather with a crocodile pattern. The red lead features a heart charm while the black lead uses a paw motif. The collars match the leads and come with a stand-alone charm. The collars are available in medium and large sizes only. Make your existing collar stand out from the crowd by attaching one of our Pink and Red Hearts ID tags ($22 each). The custom model lets you inscribe three lines of text on the back of a round or square tag featuring a heart on the front. The Heart and Stripes tag, like the three other models, is silver plated and filled with resin. All are extremely durable. Other options are the Pink Hearts and Pink Damask Silver versions. Keep your little sweetheart warm on a cold February morning or evening walk by dressing her (or him) in our Be Mine Pink Thermal Tee ($42) from Ruff Ruff Couture ®. In sizes from double extra-small to large, these shirts are made from ultra-soft thermal cotton spandex and have a tie-dye like heart design covering them. For something a bit more formal, consider dressing your little girl in our newest Valentine Dress ($50). Made with red velvet, it has red lace straps and a pink heart bow. Sizes are double extra-small to extra-large. Our Valentine's Dress is perfectly classy. Don’t leave the boys out! Our Valentine Pawlero ($40) covers his shoulders with red hearts on a white background. It also has a red collar and red ties. Sizes range from double extra-small to extra large. Want to dress your dog up in something nice this February 14? Check out our dog boutique for the Dogs Valentines collection. A Cream Valentine Dog Hoodie with Puppy Heart Print and Red Ric Rac Trim ($55.00) is handmade and features different prints and personalities. This hoodie is suitable to be worn all year long by teacup and toy breed dogs like Yorkies, Maltese and Chihuahuas or pets of similar size. Another one is for your sweetheart! A Red Valentine Dog Dresses with White Heart Lace Print ($58.00). Little dog dress made from a red background fabric with white lace heart print with each heart depicting different contrasting fabrics. It features a double ruffle skirt with white venise lace at the hem of each ruffle which adds not only color to the dress but gives it also a sweet and finished look. And still the weather is cold so there is a Preppy Heart Sweater Dress ($40.00) for the occasion. Some more of the Valentine Dog Sweater collection are Polka Dot Ribbon Dress ($40.00), Jewel Sweater Dress ($40.00) and others. Clothing is done, now what? Yes! How can we forget the Valentine Dog Treats? A 6 Valentine's Day Wagstick Treats ($27.00), Valentine's Day Paw Pad Dog Treats ($21.00) and more at the dog boutique. I think all these things will make a perfect valentine day for your doggie. Our Feather Dress is Made in the USA. Do you or a friend love dogs? If so, reward them this Valentine’s Day (Wednesday, Feb. 15) with a lovely pet gift fit for a puppy prince or princess from the Posh Puppy Boutique Valentine’s Day page. Our Valentine’s Day Feather Harness Dress ($130) is hand made in the USA with pink “love” fabric highlighted by a red feather skirt. It is topped with Swarovski crystals and a black satin bow for added flash and style. Best of all, this dress comes in sizes from extra-small to extra-large. Say “I Love You” with our Crystal Heart Dress ($38). This lovely pink creation has several large hearts and a pink ruffle, making it perfect for your little princess. There are four sizes to pick from. Consider our Hug Me All-in-One Outfit ($64) with a layered top and big bow plus pumpkin pants, all from Wooflink. It’s 100 percent cotton. Pick the most appropriate of six sizes. Give your little girl an outfit perfect for Valentine’s Day or a movie premiere: our new Starlet Dress ($48). This dress combines pink velour, red hearts and tiers of pink ruffles with a velvet crystal bow. Sizes range from double extra-small to large. Our Crystal Heart Dress comes in four sizes. Top off your dog’s new ensemble with a Large Chocolate Heart Bows collar ($30). In sizes to fit many dogs (please measure your pooch’s neck for the proper fit), it features brown bows covered with hearts in pink, red and white. Give your pup a Valentine’s Day treat in our Rose Studio Scoop Dog Bowl (on sale now for only $7, half its regular price). This perfectly pink creation is both a scoop and large bowl. It also has non-skid rubber feet in the shape of a bow tie. We have camo jackets and parkas for dogs up to size 3XL. Big, active dogs need to not only hide from prying animal eyes but stay warm and dry in outfits from the Posh Puppy Boutique. One way to keep your pooch comfortable and out of sight is by dressing them in our Military Nature Camo Overalls ($94). Available in sizes up to triple extra-large, these tracksuits are lined with polar fleece and have a nylon outer shell. They also have a detachable hood and the legs roll up for a perfect fit. Camo color choices include blue, grey and pink. For something a bit warmer, consider our St. Moritz Padded Overalls ($79). These brown/green camo overalls have a soft fur lining and hood. They attach using snap buttons. Sizes range from small to triple extra-large. Is rain a problem for your pooch when they are out in the field? Protect their core with our Idawg Cascade Camo jackets ($80). Made in the USA, these jackets have a thin jersey lining. They also have a zipper guard plus two pockets for carrying essentials in the field. Sizes range from small to extra-large. Colors include pink and black forest camo. Keep your pup warm when the temperatures drop: dress them in our Army Barmy Zip-Up Parkas ($83). Available in camo, khaki, navy and pink, these Air Force-style parkas have a nylon outer shell and polyester lining with a detachable hood. They are practical, warm and stylish. Sizes are medium and triple extra-large. Is your little girl dog a Chihuahua and her best friend a Great Dane? Outfit them both for a fun day in the snow with our Snow Overalls ($108). Available in sizes from double extra-small to triple extra-large, these wind- and water-proof overalls have removable hoods and long sleeves to protect your dog’s legs. Color choices include pink and green. For something a bit more stylish and feminine for a petite little girl, consider our Camo Harness Dress ($30). This ruffled camo dress have a thin pink bow and pink detail on the sleeves. It’s only available for teacup to small dogs (less than 3-25 pounds). These overalls come in sizes from 2X Small-3XL. Keeping your pet warm could win them a prize. Keeping your pet’s cozy warm this winter could net you three bottles of Pet Head shampoos. Pet Head—not the Posh Puppy Boutique—is sponsoring a photo contest on its Facebook page. The winner will be announced Jan. 27. Simply submit a photo of your pet in her or his winter gear then vote online for the winner. Photos can also be submitted by emailing Rachel at PetHead. Just like humans, keeping dogs warm means covering their heads, feet and body. The Posh Puppy Boutique has your dog covered, literally. Take a look at our Green and Yellow Dog Hat ($35) for small and medium-size dogs. It features ear holes, two straps to keep it tight and a white pom on top. This hat is also available in yellow and purple ($35). For something more stylish and feminine, consider our Plaid Stripe French Beret with Feather ($35). This trendy and tres chic hat topped with a black feather comes in sizes from extra-small to extra-large. It is handmade in the USA. The mucho macho version is our Wedding Blues Gentleman Dog Beret ($35) with sparkling beads in the center and a blue feather. Protect your pup’s head and neck with our red, pink and white Knit Hat and Scarf combo ($68) for small and medium dogs. Your pooch will be both protected and stylish in one of our many pet parkas. Our fully lined Girly Pink and Black Dog Coat ($39) has a detachable faux fur hood, puff sleeves and ribbon detailing. Sizes range from extra-small to large. We have several knit hats for small and medium dogs. Active outdoor dogs will love our fleece-lined Camouflage Coat with Detachable Hood ($40). It has adjustable elastic bands. Sizes range from extra small to extra-large. Keep your dog warm and comfortable on their daily runs with our Black Platinum Coat ($55). It has a waterproof exterior, fleece interior and full hip coverage plus ANSI2 reflective trim for greater visibility in low-light. Sizes range from teacup to double extra large. Two widths are also available. While keeping your dog’s head and torso warm is important, don’t forget their feet. The Posh Puppy Boutique carries a wide range of footwear to fit every dog. For example, our black All Weather Boots ($58 for a set of four) are designed for harsh winter weather. They have a non-skid rubber sole and drawstrings at the top to keep out rain and snow. Add style to your dog’s winter comfort with our Paw Print Dog Boots ($65 for a set of four). Made with pleather, they are lined with fleece and have rubber soles and adjustable Velcro ankle straps. These and many more winter pet clothing options are available now at the Posh Puppy Boutique. Call us at 888-837-5230 with any questions. Stay updated on all the latest pet fashion action by following us on Facebook and Twitter. Tiffi Blue: elegance, simplicity, style. Check out the brand-new Tiffi Blue line of fashionable dog products from designer Susan Lanci now available at the Posh Puppy Boutique. Susan Lanci products are proudly Made in the USA. Tiffi’s Gift Tinkie Harness- Silver Stardust Tail Bow Heart ($90) features a large bow on Ultrasuede ® fabric and crystallized Swarovski Elements hang tag. You have 10 sizes options ranging from teacup to extra-large so you can find one that fits your little angel perfectly. For a slightly smaller bow, check out Tiffi’s Gift Harness- Silver Stardust Tail Bow Heart ($90). This harness is similar—but not identical—to the “Tinkie” model. Both feature pretty pale blue collars that attach with Velcro. For a pure, simple and elegant step-in harness, take a close look at Tiffi Blue’s Tail Bow Heart Pure & Simple model ($78). This model uses a single quick-release buckle just above the dog’s shoulders. Leash control affects only your dog’s shoulders, not the delicate bones in their neck. This harness features a blue bow and Swarovski crystal accent. · Blue and Silver Stardust ($86) with its silver sparkles throughout. · Giltmore XL Pure & Simple ($78) with Swarovski crystal elements on the shoulder. · Embellished Pure & Simple with Crystal Paws ($75) with a crystal “paw print” on the shoulder. · Embellished Pure & Simple with Cupcake ($75) with a small pink and yellow cupcake on the shoulder. · Solid Tiffi Blue ($55) with a solid color that shows simplicity and elegance. The Posh Puppy’s Tiffi Blue line from Susan Lanci also includes “standard” harnesses featuring Cup Cakes ($65), the Giltmore 4 Row ($85), Butterfly and Bees ($78), Daisy ($68) and Skull ($65). All of these Tiffi Blue harnesses can be complimented with the matching Tiffi Blue Ultrasuede Dog Leash ($60). The leashes come in 33 colors ranging from Amethyst to Zebra. 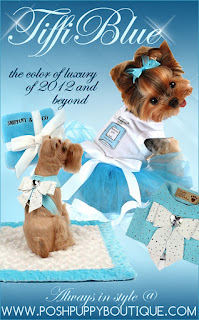 Top your dog’s Tiffi Blue outfit off with a matching Big Bow Hair Bow ($20 each). These bows feature a one piece construction that grabs more hair and stays in place better. These and other fashionable Tiffi Blue dog items—plus literally thousands of other dog (and cat) items—are available now through the Posh Puppy Boutique. Give your dog a distinctive look with pet-friendly hair dyes. Humans aren’t the only “people” who like to feel pampered and pretty. Dogs do too! Start by giving your dog a bath using some of the top brand-name products available at the Posh Puppy Boutique then spice your pup up with some hair dye gel and nail polish. Our grooming product lines include Cain & Able, John Paul – Paul Mitchell, Tropiclean Spa, Happy Tails, Haute Dog, Nootie and Pet Head. Our hair dye gel ($30) comes in black, blue, brown, green, orange, pink, purple, red and yellow. It’s completely non-toxic and will last 4-6 washes. Best of all, it is safe for dogs and cats over 12 weeks old. 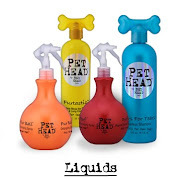 Another option is our Color Me Bad ($12) hair dyes for pets from Pet Head by Bed Head Tigi. Color choices include Growlin Green,Barkin Blue, Punked Pooch Purple and Woofalicious Pink. Complete your pet pedicure with a product that not only adds color and style to your pet, but protects your floors, your pets and people they come in contact with: Soft Claws Nail Caps ($25). These vinyl caps glue on to your dog’s nails, making them blunt and harmless. They come in sizes ranging from extra small to jumbo. Each pack includes 40 nail caps. Color choices include black, blue, blue sparkle, gold sparkle, natural, pink, pink sparkle, red and silver sparkle. · The Pawdicure Polish Pen ($13) applies a quick drying, non-toxic coat of nail polish for dogs that covers in one coat. Color choices are blue, pink, red, purple and white. · Color Paw Premium Pet Nail Polish Pens ($7) come in True Red, Candy Pink Pearl, Hot Pink, Blueberry Pear and Poppin’ Purple. The fast drying formula covers in one coat. · Color Paw Nail Polish ($5) uses a water- and chip-resistant formula that comes in 27 colors ranging from Amethyst Shimmer to Violet Sparkle and Gold Metallic. The Posh Puppy Boutique has everything to keep your new arrival comfortable, cozy and clean. Did the holidays bring you or yours a new puppy? 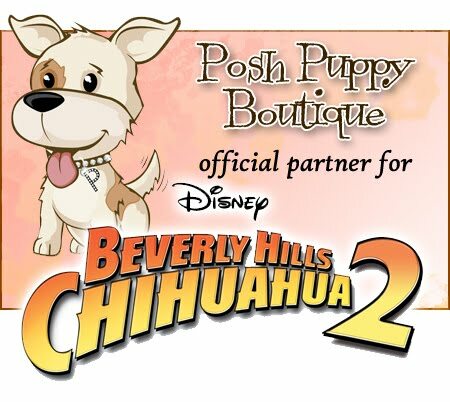 If so, equip them with the highest quality, most fashionable pet accessories around from thePosh Puppy Boutique. Start by keeping them warm on cold winter days and nights with our Louis Dog Baby Dog Hoodie ($90) in either antique blue or milk cocoa. Both have faux fur trimming on the hood. They are comfortable for your pet and easy to take on and off. Available in extra-small and small sizes only. Our Louis Dog Baby Hoodie is designed for small dogs. Help them stay comfortable—and your clothes and furniture intact—with our Chilly Bone Freezable Teething Toys ($12). Simply soak and freeze then let your pup soothe their painful gums. Let your puppy play and take care of their growing teeth by giving them a Puppy Kong ® Squeaker, Wubba or Binkie ($7 each). The squeaker comes in several sizes, the binkie in small or medium and all three come in blue or pink. Unlike the adult Kongs, these are not designed to be stuffed with treats. Feed them in our Cane Puppy Saucers ($25) with interiors in blue or pink. Dishwasher safe, these dishes are 5 inches in diameter and 1.5 inches deep. Another option is our Puppy Love Starter Dining Set ($30) with a porcelain dog bowl, feeding spoon and soft touch collar. Move them and keep them with you by carrying your new bundle of joy in our My First Louis Dog Carrier ($260). This mini size combines comfort for your pet and style for you. Available in Velvet Bean or Beige. Keep them clean with a Baby Bebe Puppy Pack ($46), which includes a 10 ounce bottle of Baby Bebe Puppy Shampoo, an 8 ounce container of Baby Bebe Puppy Spray and a yellow cotton “You’re So Cute” towel all packed in a vinyl carrying case. For the ultimate in puppy love, consider our New Puppy Welcome Dog Gift Box ($175). Inside you will find: a ceramic bowl in pink and blue, Orbee bones by Planet Dog, plush squeak toys by Planet Dog, turkey-parmesan organic treats baked for ARFdog by Robbie Dawg and a copy of Miss Manners Book of Etiquette.